I’ve told you all about my love of Mario Tennis before. It’s a game that’s near and dear to me, as much as any other release in Nintendo’s vast, unparalleled oeuvre. I’ve also devoted plenty of internet ink to Super Smash Bros., particularly how that series has tried to manage the fact that it means drastically different things to different people. Some players love Smash at its most manic, an anarchic spectacle where the tide of battle can change at any moment. Others, like myself, prefer to strip all the randomness and noise away and play it as something that resembles a pure skill-based fighting game. It wasn’t until playing the new Mario Tennis: Ultra Smash for the Wii U that I realized Mario Tennis suffers from a similar internal debate between choosing to follow either chaos or skill. The difference is Super Smash Bros. knows both directives are worth pursuing and confidently stands at the intersection between the two. Mario Tennis just comes off as confused and misguided. Even as someone who’d rather play Smash Bros. with all the items turned off and the wildest battlegrounds omitted, I still enjoy the game when all the bells and whistles are turned on. It’s just a different kind of game, one that’s more about embracing chance and letting go of your competitive drive. That opens the game up to more people, those who don’t want to worry about learning the best strategies to counter each character or deal with the stress of overbearing competition, and that’s undeniably important. But instead of watering down the frenzied fighting game at its core to find that accessibility, Smash Bros. transforms itself into something else completely—a vehicle for boisterous, Nintendo-nostalgia-driven chaos. 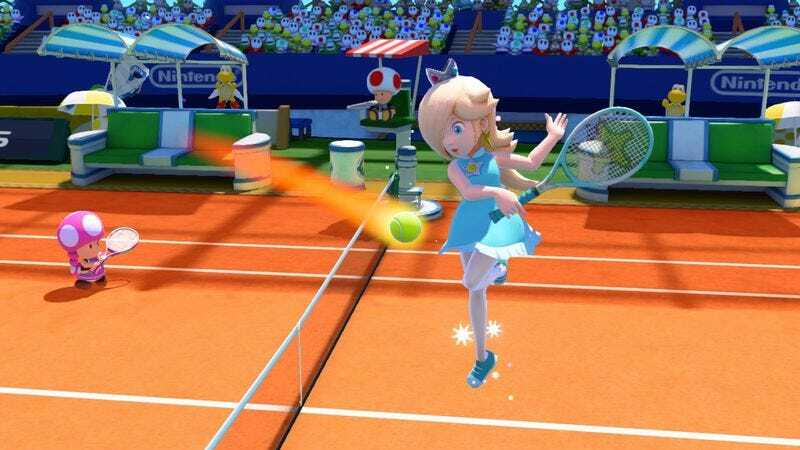 Mario Tennis’ attempts to spice things up and downplay pure skill-based action have been far less successful. Ultra Smash borrows much from Mario Tennis Open, the series’ 3DS installment, including the concept of “Chance Shots,” where the game tells you where to stand and which button to hit for a super-powered volley. They appear constantly, and they sap anything resembling strategy and tension out of the game. It’s more Simon Says than tennis, and it’s just plain boring. You can play without these and the game’s other impotent bells and whistles in the “Classic Tennis” mode. Here, the pure tennis game you’re left with is as stellar as ever—fast-paced, lean, and colorful. But if that’s what you’re looking for, Ultra Smash hopes you’ll be content with doing nothing but going head to head with friends—always the best way to play Mario Tennis, anyway—or having meaningless exhibition match after meaningless exhibition match with computer-controlled opponents, as those are the only game types that take advantage of “Classic Mode.” The rest of Ultra Smash’s anemic offerings—there’s no tournament or story mode—dump you into its diluted vision of tennis. Nintendo has been on fire as of late, so the prospect of getting a Mario Tennis imbued with some of the vigor and imagination that revitalized the likes of Mario Kart was beyond exciting. Sadly, Ultra Smash feels like it wasn’t afforded the same attention. I’ll keep playing it with friends, because that’s how much I love Mario Tennis, but Ultra Smash can keep its Mega Mushrooms and Chance Shots to itself. I’m just here for the tennis.